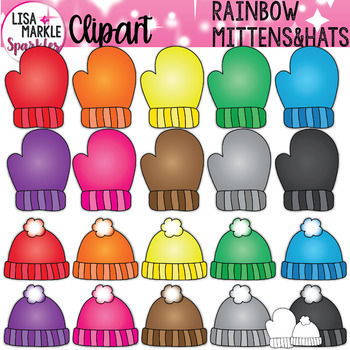 This is a set of ten different colors of winter mittens and hats! These would be great for matching activities, counting activities, back to school classroom decor, labels, and center printables. Add these to your winter and cold weather themed learning! There is also black and white versions of each graphic included for coloring activities. There are 22 graphics total. Each graphic is a 300 DPI PNG file with a transparent background. Personal and small commercial use acceptable! Enjoy! Check out my other rainbow clipart to meet your classroom needs!